Star SP542 - Impact, 4 lines/sec, 3" width, USB interface, auto-cutter. Includes power supply. Order cables separately. See accessories. Color: gray. Also known as SP542MU42GRY-120US. The Star SP542 with auto-cutter combines renowned reliability and a multitude of high-end features into a compact, value-driven solution. Features such as the logic seeking mechanism, new high-speed printhead and the latest electronics contribute to the high print speed of the SP542. This print speed of over 4 lines per second enables the SP542 to outperform the competitors in its class. The hinged cover of the SP542, with its integrated 'rain channel', protects the printer form liquid spills and other debris. Protection from the elements and the single color highlight feature of the SP542 series provide an excellent solution for food service and kitchen applications where airborne debris is a sure factor. Wall mounting kit for the SP500 series printers. 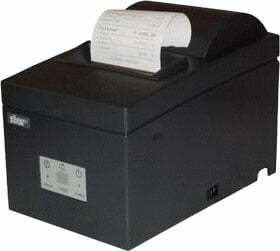 The Star 37998040 is also known as Star Micronics	STA-37998040	.